Josh Ronsen formed brekekekexkoaxkoax as a vehicle for solo prepared guitar performances in 1996, but collaborations with other artists as equals started on day one. Rick Reed first projected his film work at the first brekekekexkoaxkoax performance. 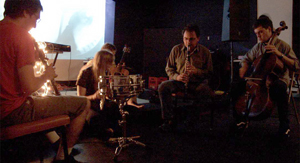 Other collaborators have been John Grzinich, Michael Northam, Jason Pierce, Steev Hise and three improvising quartets of multi-instrumentalists (Jacob Green, Bill Thompson, Vanessa Arn), (Jacob Green, Genevieve Walsh, Glen Nuckolls) and (Jacob Green, Thomas Fang and Greg Headley). Josh Russell, Travis Weller, Mari Akita, Alex Keller, Brent Fariss, and Nick Hennies have also contributed in special projects. A brekekekexkoaxkoax experience can include noise, light, movement, blindfolds, handphones (hand-mounted speakers), literature, performance art, foil, string. There is no common thread of reason which links all brekekekexkoaxkoax events. Instead, each one opens new methods of creativity, exploring new modes of internal (unconscious?) desire. Appearing on 2 dozen recordings and compilations, the music can be downloaded on a few web sites. “It's like a Logical Positivist,” he said.